In this episode, Kelli interviews Jenny Marrs, blogger and mom of 4 wonderful little ones. Jenny started her adoption process in 2011. Shortly after legally adopting her daughter, the Republic of the Congo put a hold on exit permits making them unable to bring home their adopted daughter for two years. Jenny [6:30]: It was living in a state of absolute constant stress all the time. While she waited to bring her daughter home, Jenny felt herself stretched to her limits. At times, she felt close to giving up hope that it would ever happen. Jenny [9:57]: I do think,like anytime you are going through something hard if you’re a believer, that I clung to the Lord more than ever during that time frame. Her family started an initiative, Feed Their Tummies, during this time in order to refocus their attention and to impact the lives of others in the Congo. By doing something tangible, it allowed her wait to feel a little more fruitful. Once her adopted daughter was home, Jenny found herself simply out of gas, emotionally, physically, and spiritually. 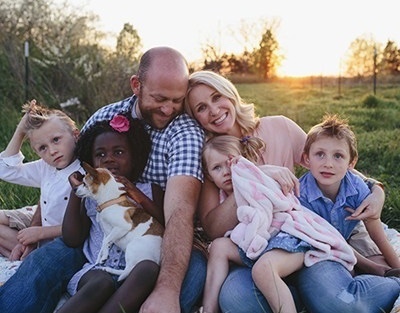 With 4 kids under 4 (including her own newborn), she simply survived that first year. Jenny [17:14]: It felt like I was out walking in a field and I never knew when I was going to step on a landmine. In order to ease the transition and help both of them cope with the trauma, Jenny started attachment therapy with her adoptive daughter. Jenny [22:53]: I did have a deep love for her, I just never realized how hard it would be to attach. The stress of the past few years manifested physically for Jenny, forcing her to stop, take a breath, and focus on herself. She learned that it’s okay to not be okay as a mom. It’s okay to need to take a break from your kids. Jenny started journaling during this time which allowed her to release the stress and anxiety that plagued her. She refocused her reliance on God, really learned to listen to what he was trying to tell her, and give herself over to him.